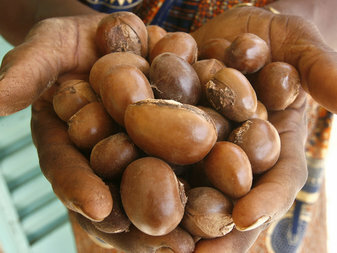 A few of the estimated 16 million African women who pick shea nuts for a living are going to be making their case for fair trade to the giant corporations who buy their nuts in New York City on Monday. These women — many of them making their first trip outside Africa — are the main attraction at the first-ever Shea Butter Trade Industry conference in North America. They will rub shoulders in a midtown Manhattan hotel with cosmetic industry titans — the likes of L’Oréal, Kao (maker of Jergens brand products) and the Body Shop — as well as large-scale chocolatiers and confectioners. 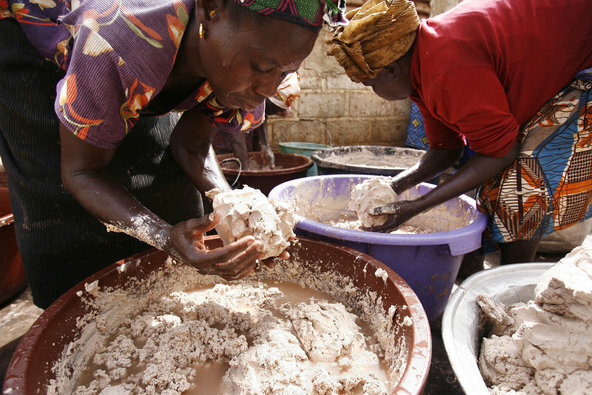 In rural villages across West Africa, women use traditional methods to extract the fat from shea nuts, producing shea butter, a solid, whitish-yellow vegetable fat. They use it for cooking and for skin care. This same fat is the main ingredient in the Body Shop’s best-selling Chocomania Body Butter and many other skin-care products. For confectioners, specialty fats made from shea are used to make “cocoa butter equivalents” that give chocolate a higher melting point and a smoother texture. You can see how one community in northern Ghana extracts shea butter here. The women coming to New York want their corporate buyers to pay a fair price. They also want them to buy and use more shea in food products. Shea is currently used to make Kit Kat bars, Almond Joys, Milky Ways and other confections. That sustainability is in his interest too. His firm purchases an estimated 25 percent of all the shea nuts picked by women in West Africa for use in confectioneries. Mr. Turpin will be explaining the supply chain, “from tree to chocolate,” on Monday and making a case for how shea can be used. The conference organizers, the Global Shea Alliance, was first brought together by the West Africa Trade Hub, an offshoot of the United States Agency for International Development, in 2011. Now it is an independent body, and this gathering is their coming out. In the same way that the members up and down the supply chain involved in other global commodities, most famously coffee, have embraced fair trade, many stakeholders in the shea business hope to do the same. One of the alliance’s stated goals is that the women who pick the shea nuts get good prices but also deliver better quality product. They are coming to New York “to develop a strategy to empower the millions of women who collect shea nuts,” said Salima Makama, the association’s president. Development consultants will join them. A 2010 U.S.A.I.D. survey conducted in Burkina Faso found that for every $1,000 worth of shea nuts sold, an additional $1,580 in economic activity was generated for the village. It’s estimated that shea exports from West Africa total $90 million to $200 million a year. The trees grow in the savannah region that lies south of the Sahel in an area totaling 3 million square kilometers, or 1.15 million square miles, and extends from Senegal to South Sudan. This area is dry and generally flat. Shea trees appear to grow at random in the wild but are actually managed on parklands.